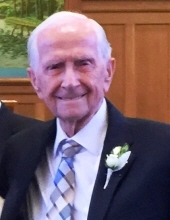 DURHAM: William “Bill” Merritt, 91, passed away on Saturday, November 17, 2018 at his home.. He was born in Durham, North Carolina, the son of the late Hubert Ernest Merritt and Annie Iola Ferrell Merritt. In addition to his parents, Mr. Merritt was preceded in death by his first wife Shirley Ann Brown Merritt of 67 years, sons Alan Merritt and Connie Merritt; granddaughter Rebecca Anne Merritt, 5 brothers and 2 sisters. Mr. Merritt served in the Navy during World War II and was awarded a Victory Medal. Mr. Merritt retired from IBM. He was a faithful and devoted member of Guess Road Baptist Church for 60 years in many positions, including deacon and trustee, always putting God first. He was a Gideon where he placed Bibles in motels and other places. Mr. Merritt is survived by his wife, Janie Ashworth Merritt; sisters, Dot and Francis; brother in law, Carl; step daughter, Annette Faris and husband John; grandchildren, David Merritt and wife Abigail, Michael Merritt and wife Dana, Ashlyn Merritt and Phillip Murray; step grandchildren, Trey Williams and Travis Williams; great grandchildren Joshua Merritt, Jacob Merritt, William Parker Merritt, William Matheson Merritt, Wyatt Merritt, and Jaxson Merritt. A funeral service will be held 11 a.m. Tuesday November 20, 2018 at Guess Road Baptist Church in Durham. Burial will follow the service at Woodlawn Memorial Park in Durham. The family will receive friends Monday evening from 5 to 8 p.m. at Clements Funeral Home in Durham, North Carolina. In lieu of flowers donations can be made to Guess Road Baptist Church, 3102 Guess Rd, Durham, NC 2770 or Gideon’s International, P.O. Box 140800, Nashville, TN 37214. To send flowers or a remembrance gift to the family of William "Bill" Merritt, please visit our Tribute Store. "Email Address" would like to share the life celebration of William "Bill" Merritt. Click on the "link" to go to share a favorite memory or leave a condolence message for the family.